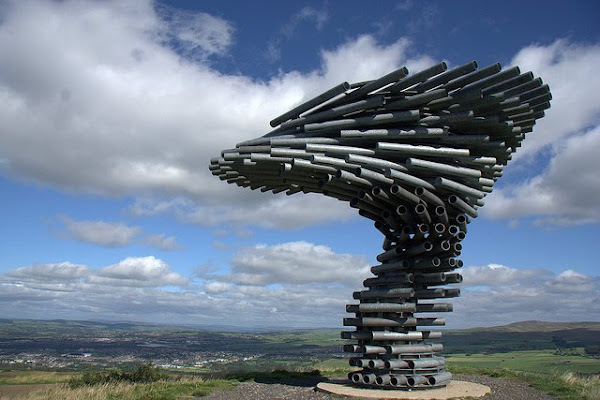 The Singing Ringing Tree is a wind powered sound sculpture resembling a tree set in the landscape of the Pennine mountain range overlooking Burnley, in Lancashire, England. 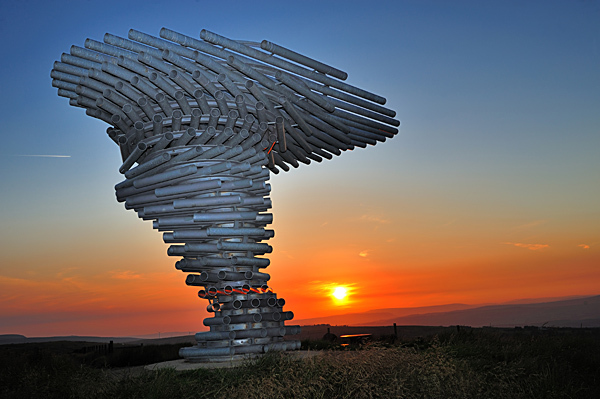 Completed in 2006, it is part of the series of four sculptures within the Panopticons arts and regeneration project created by the East Lancashire Environmental Arts Network (ELEAN). The project was set up to erect a series of 21st-century landmarks, or Panopticons (structures providing a comprehensive view), across East Lancashire as symbols of the renaissance of the area. 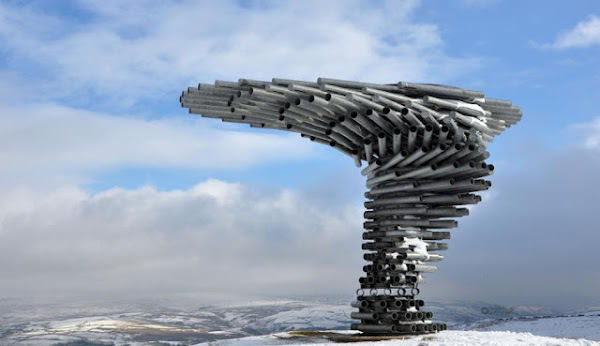 Designed by architects Mike Tonkin and Anna Liu of Tonkin Liu, the Singing Ringing Tree is a 3 metre tall construction comprising pipes of galvanised steel which harness the energy of the wind to produce a slightly discordant and penetrating choral sound covering a range of several octaves. Some of the pipes are primarily structural and aesthetic elements, while others have been cut across their width enabling the sound. 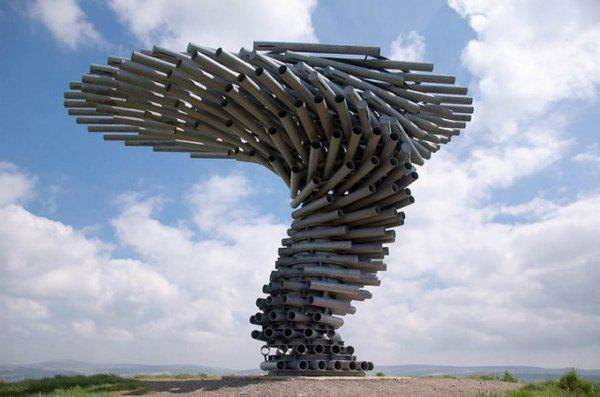 The harmonic and singing qualities of the tree were produced by tuning the pipes according to their length by adding holes to the underside of each. 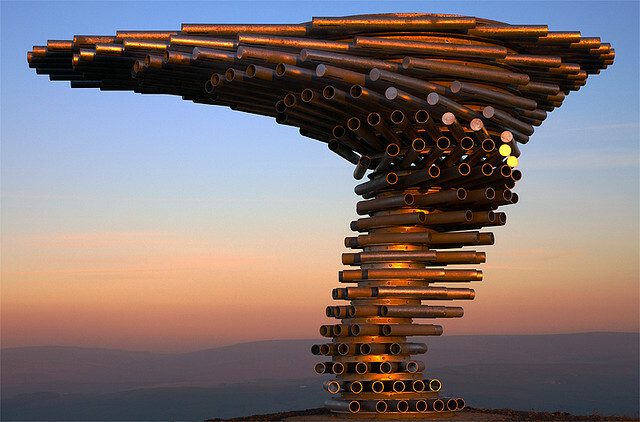 The unique musical sculpture in the form of a tree appears to bend against the winds that pass over the hills. Designed by award-winning architects Tonkin-Liu. The wind produces a low and mellow hum through pipes which are tuned so that they do not disturb the wildlife. The singing qualities of the tree were produced by tuning the pipes according to their length by adding holes to the underside of each. In 2007, the sculpture won (along with 13 other candidates) the National Award of the Royal Institute of British Architects (RIBA) for architectural excellence.